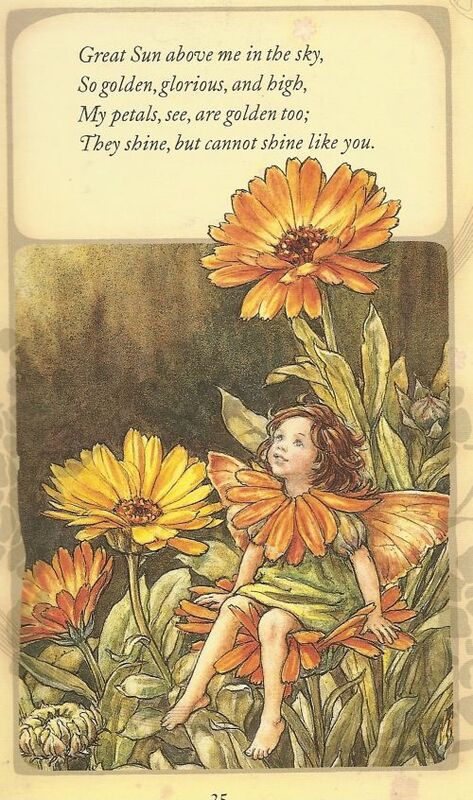 Summer faeries love nothing more than basking upon thier petals, feelilng the sun's warm rays. The long, hot days provide the perfect opportunity to relax and summer faeries are probabbly the most leisurely of all the faeries. IT is also the ime for outdoor parties and pcnincs in the Flower Faerie Garden. The ROSE faerie tiptoes aobut her plant, picking off the odl petals from her flowers. she chooses the softest petals to dress in and is never hurt by her own thorns. Rose gives gifts of perfumed rose water to teh other faeries in the garden. Carryin a pile of his precious red berries, STRAWBERRY is on his way to a feairy picnic, He is generous with his deliciuos fruit and veyr popular with his many faerie freinds! MARIGOLD is usually found in the sunniest spot. she loves to soal up the sunshine, and her vivid color refelcts the sun's golden rays.